NEW BRITAIN - Roberto Mercado called it a humbling experience. That’s how the New Britain baseball head coach described being a presenter at the World Baseball Convention at Mohegan Sun back in January. The head coach was among 39 others who were there to talk about the different aspects of the sport from batting practice and fielding drills to throwing programs for pitchers to how to build a successful program. Each presentation lasted about 45 minutes and included tutorials from Yankees pitcher J.A. Happ; Rays manager Kevin Cash; former Major Leaguer Mark DeRosa; Matt Hyde, the Northeast Area Scout for the Yankees; Mike Bell, the head coach at Pitt and former pitching coach at Florida State; and Scott Stricklin, the head coach at Georgia, among others. Mercado gave his presentation on a high school coach’s checklist from September to the first game of the season, breaking down areas from fundraising to workout programs to tryouts and offseason practice routines. “I got a lot of positive feedback on it,” Mercado said. The Hurricanes head coach was first approached with the idea of presenting at the forum by Adam Jasemsky and Rick Orluk, who run marketing and event operations for the World Baseball Convention. 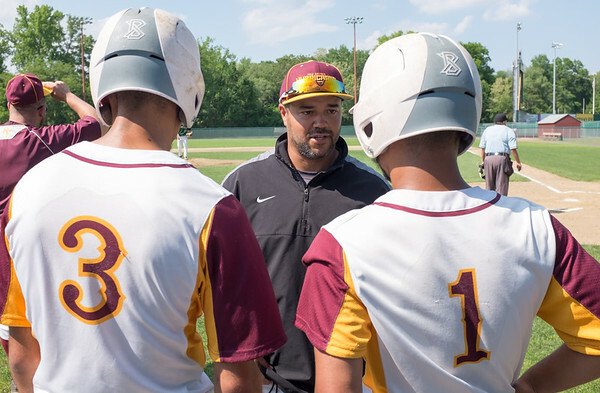 The two learned of Mercado through his summer coaching job as an assistant in the Cape Cod League, which often features some of the best collegiate players in the country. It didn’t take long for Mercado to accept from there. And before and after his presentation, Mercado make sure to attend or get the information from a number of panelists as well. As he puts it, it’s never a bad opportunity to learn and pick up some new tips and drills to bring into a program. From Steve Trimper, the head coach of Stenson University, Mercado took some little nuances about base running and the hit and run. There was the throwing program Bell uses with his pitchers at Pitt and how a program in the SEC - Georgia - goes about its practices. Overall, it was quite experience for the head coach and the opportunity it presents not only his program at New Britain, but the city as well. Posted in New Britain Herald, New Britain on Thursday, 7 February 2019 21:39. Updated: Thursday, 7 February 2019 21:41.